Do you want to backup your iPod files to your local computer? Do you want to transfer your files from your old iPod to your new iPod? Do you want to transfer your iPod files to your new iTunes? Do you want to transfer local files to iPod without iTunes? Do you want to make and transfer your own iphone ringtone to your iPhone? This article is quoted from squidoo and it shows us how to transfer iPod files to iPod/Computer/iTunes for both Windows and Mac uses and how to make your own iPhone ringtone, then transfer it to your iPhone directly without iTunes. Step 0: Free download iPod to iPod/Computer/iTunes Transfer install and run it. Please make sure that your iTunes is closed when you use the software. Step 1: Connect your iPod/iPhone to your computer via USB cable. After done, the iPod/iPhone icon and its library and playlists will appear in the Device list. Open the library/playlist that you want to add files into. A: If you want to add a folder containing all files you want, please click the Add files drop-down button, and choose the Add Folder to List option, and then locate the folder to your iPod/iPhone. B: When the software is started, it will modify the automatic synchronization of music/video to manual synchronization between iPod and iTunes. Step 0: Free download iPod to Mac Transfer , install and run it. All information about your iPod, such as type, capacity, version, serial number, and format, will be shown on the main interface.Tip: All functions for iPod are applicable to iPhone, iPhone 3G, iPhone 3GS as well except for the photo management. Open the library/playlist that you want to transfer. Click the "Add files to iPod" or "Add Folder to iPod" button. Step 2: Locate the required audio files on the pop-up dialogbox and click "Open" button to import selected files to your iPod. Step 3: Edit iPod PlaylistTo those who want to create their own personalized iPod Playlist, you can try this function. Choose the "File -> Playlist" option to create a new list , and then choose the "New Playlist" option from the submenu. Drag & drop to import or export files need and drag it to the local, or you can choose the file from the local and drag it to the iPod. Part 3: How to make your own iPhone Ringtone and transfer it to your iPhone directly. 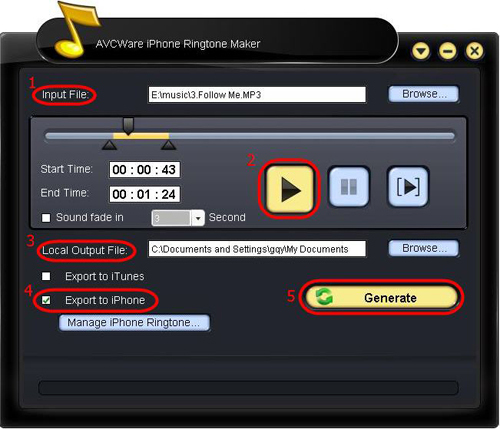 Download AVCWare iPhone Ringtone Maker, install and run it. The main interface pops up. 4. If you want, check "Export to iPhone" option to let the program upload the output ringtone to your iPhone directly after conversion. 5. After all above are finished, click "Generate" button to start creating your own iPhone ringtone. During the creation, you can check the process by the progress bar at the bottom. Just in a few minutes, you make your own iPhone ringtone from the loved music.